For more than 20 years, Nova Dental Partners has been one of the leading cosmetic dental offices in the Northern Virginia communities of Alexandria and Woodbridge. Using state-of-the-art technology and modern materials, Drs. Kambiz and Kamran Tavakkoli can correct missing, chipped, discolored, or crooked teeth easier than ever before. One of our patients recently came to us to restore their front teeth. Understandably, she was very concerned whether the restorations would match her existing teeth. These concerns are very normal and the good news is that with today's advancements, you no longer have to suffer the embarrassment of an unsightly discoloured teeth. 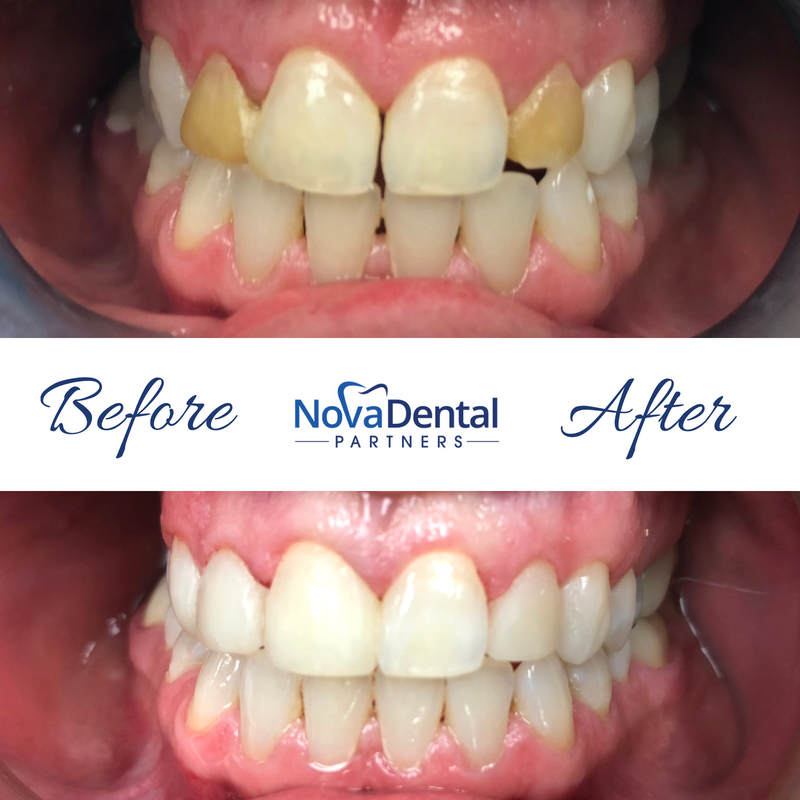 In just one appointment, using composite veneers we were able to address the canted midline, asymmetrical front teeth and discolored restorations. You might be surprised to hear that this entire procedure was completed in just one appointment! Typically there are no injections required and in this case we used a veneer that does not require much tooth reduction. As you can see from the results, our patient was thrilled with the results and so were we. Another patient recently came to us to restore their front teeth. 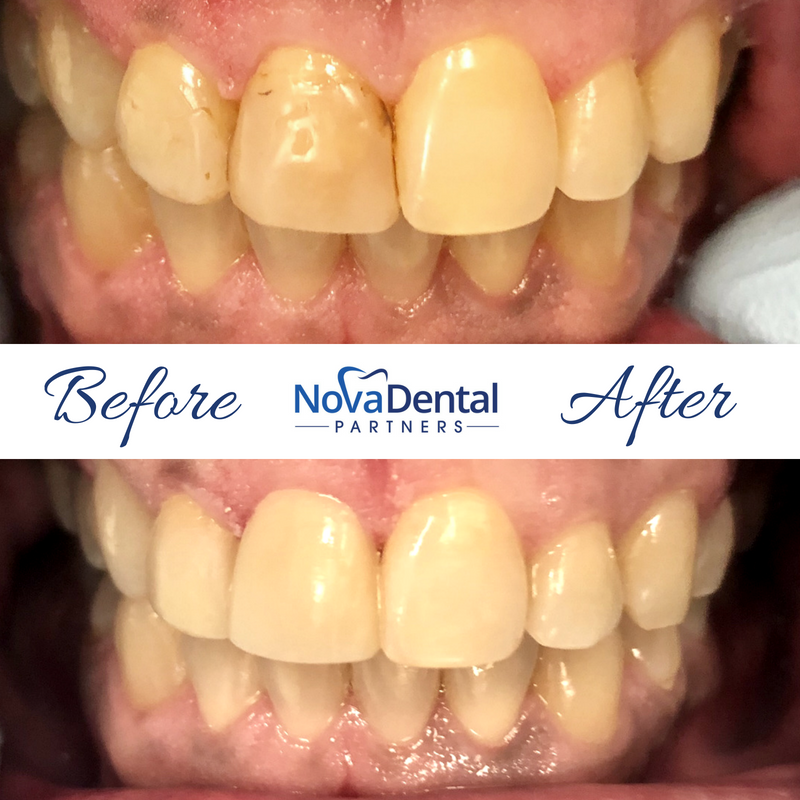 In just one appointment and no numbing required, Dr. Tavakkoli was able to restore the two front teeth with on small composite resin filling and one composite resin chairside veneer. During your comprehensive exam, our doctors will ensure that there are no underlying health issues, such as cavities or periodontal disease, which will need to be addressed before a smile makeover can begin. He will consider your desires, present all your options, and help you decide the best course of action for your smile. It’s time to get the smile you’ve always wanted—the one you deserve! Contact our Mount Vernon, Lake Ridge, Old Town, or King Street Station dental offices to schedule an initial consultation with Drs. Kambiz Tavakkoli, Kamran Tavakkoli and Bryan Choi today! Dr. Kamran and Kambiz Tavakkoli are the founders of Nova Dental Partners with three practice locations in Mount Vernon Alexandria, Old Town Alexandria and Lake Ridge in Woodbridge. The Tavakkoli brothers are leading dentists in Northern Virginia and have gained a reputation of excellence in the dental community.. They are experts in general and cosmetic dentistry and are certified providers of Invisalign and Lumineers.